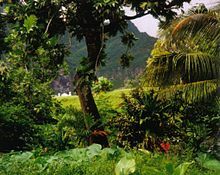 The rainforest in Fatu-Hiva, in the Marquesas Islands, is an ensaumple o an undisturbed naitural resoorce. Forest provides timmer for humans, fuid an shelter for the flora an fauna. The nutrient cycle atween organisms form fuid cheens an biodiversity o species. Naitural resoorces are resoorces that exist withoot actions o humankynd. This includes aw vailyied chairactereestics sic as magnetic, gravitational, an electrical properties an forces etc. This page wis last eeditit on 23 Dizember 2017, at 03:06.